On Sunday, NHL had a birthday party to go to. While he was having fun there with B, I decided that JSL and I should have a father-son day out. After all, he had just endured 8 days of Passover food and none of the food he usually likes. After a quick lunch at Five Guys (grilled veggie sandwich for me and grilled cheese for JSL), we headed to a big park. There, JSL ran through the hedge maze, played tag with me in the big fields, led the way through a hike on the wooded path, and finally played on the playground. As the time to leave approached, I let JSL know we’d only stay five minutes longer. While we were waiting for a swing to free up, suddenly, the playground was invaded. A hawk flew right behind the swinging kids and swooped towards a black bird on the ground nearby. 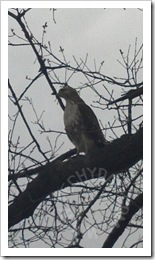 The bird got away so the hawk then, without skipping a beat, flew back up to the branches of a nearby tree. Usually, I’d have went over to take photos with my DSLR. However, in an effort to travel light, I decided to leave my DSLR at home. I had my new camera phone, but JSL really wanted to swing. So I resorted to that old parental standby: bribery. I told JSL that if he came with me to get some hawk photos, I’d not only restart our "countdown until we leave the park" timer, but I’d also add five extra minutes. JSL reluctantly left the swing area and came with me where I (and someone else with the same idea as me) took a few hawk photos. Unfortunately, they didn’t come out great. Camera phones can take decent photos in some situations, but this wasn’t one of them. My DSLR would have taken a much better photo. 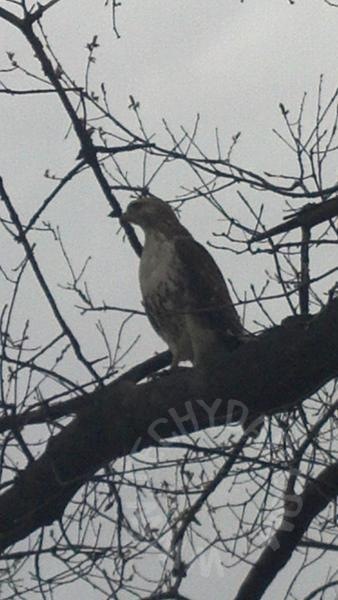 Still, at least I got some record of the hawk that almost turned the playground into a feeding ground. I also learned an important lesson: The more times I can take my DSLR out with me, the better!